About Us - Purity Life Health Products LP. Since our inception in 1984, Purity Life has been proud to supply Canada with the highest quality natural healthy living products. Beginning with our Founders, David and Elyse Chapman, we have always aimed to provide excellence in products as well as customer service. These are values we are still proud of today, and we are proud to be the leading distributor in Canada! With our locations in Acton, Ontario and Vancouver, British Columbia, we are able to supply over 7 000 stores Canada Wide, making natural healthy living easily accessible for Canadians! It has been, and will continue to be, our goal to provide Canadians with natural healthy living products ranging from dietary supplements like Vitamins and Supplements, to natural body care, to eco friendly household goods and natural health food products that fit their lifestyle! We are proud to provide Canadians with natural personal care, natural health products and natural beauty products for your every day use! Natural Health Products make a difference in People’s lives. To be Canada’s most valuable Natural Health Product distributor. Purity Life will improve the health of Canadians by an unrivaled and innovative Natural Health Products Portfolio to our customers. Purity Life will provide a rewarding and safe workplace for our employees. We will conduct our business based on operational excellence, integrity, transparency, mutual respect and collaboration. For more than twenty years, this vision has helped guide Purity Life to become Canada’s number one supplier of natural health products, directly servicing over 5,000 health food, pharmacy and practitioner accounts across Canada through its office in Acton, Ontario. Purity Life may have begun as a small distributor, but through its commitment to customer and client satisfaction, it quickly grew to be the largest distributor of supplements and Health and Beauty products in Canada. Purity Life is still privately owned by our current President and CEO Matthew James and Banyan Capital Partners employing over 130 team members across Canada. Purity Life wins CHFA Supplier of Excellence award. Purity Life celebrates 30 years of distrubuting products that make a difference in people’s lives. Purity Life launches first retailer online ordering system with real time inventory & invoice/statement lookup. Purity Life creates “HABA-cadabra! with category management” booklet, and wins CHFA Supplier of Excellence award. Sunopta sells Purity Life to Matthew James and Banyan Capital partners and wins CHFA Supplier of Excellence award. Purity Life grows rapidly with the addition of new lines and additional sales people. Purity Life launches “natural body care products: a glossary of terms and ingredients”. SunOpta purchases Purity Life as well as Quest/Herbon brands and Purity Life opens large western warehouse to service western retailers. Purity Life purchases the Vita Health distribution which includes the Natures Harmony brand and wins CHFA supplier of excellence award. Purity Life launches a whole new category in Canada and the United States – Immune Modulation with Moducare. Purity Life adds a large addition to its head office in Acton and installs automated carousel systems to increase productivity and turnaround. 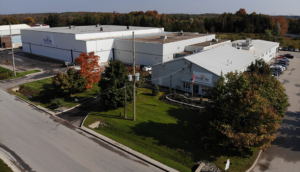 Purity Life moves to current head office location in Acton, Ontario. Purity Life grows to 35 full time employees. Purity Life starts distributing Weleda; Hires our first western sales rep and opens a Vancouver sales office and small warehouse. Purity Life introduces and launches the first tea tree oil product in Canada – Thursday Plantation. Purity Life starts distributing Kiss My Face and Quantum. Our third employee, Donna Bannister, is hired and is still with the Purity Life today. David and Elyse Chapman launch Purity Life as a mail order business with the first products being Barlow knee support, Apricot kernels, Aerobic 07, and Lavilin deodorant, the last of which Purity still distributes today.